In the High Country outdoor life is a part of our lifestyle. Those that live here and own vacation retreats love the mountain scenery and want to take full advantage of the views that they have. Decks and porches are a great add on to any property. We have designed and constructed countless decks for clients in Boone, Blowing Rock, Valle Crucis and Banner Elk. If you have some ideas, we can make your dreams a reality. We also work with clients that are unsure of what they want visually, but know what they want to feel when using their deck. 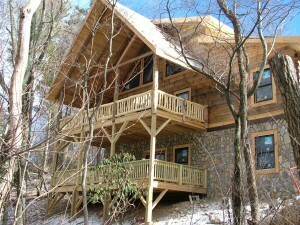 Check out some of the Decks Boone NC jobs that we have completed. Covered and enclosed porches are also a nice addition to any property. Imagine sitting out on the enclosed porch and having a nice meal. Screens and other materials can be added to the porch to keep the bugs out and away, yet still give you the feeling of being in the open air. Take full advantage of your property, contact us to discuss the options for deck building or a porch.